I love being surprised by the students. 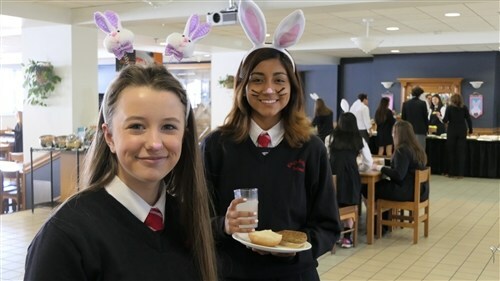 Whether it is the spontaneous offer by Amy Cornick (2019) of one her delicious homemade Easter cupcakes or seeing lifers Duncan Ferguson and Eric Dufour (both 2018) try rugby in their last term before graduation. It is wonderful when teenagers do the unexpected. Returning from a holiday, the traditional greeting on campus includes the enquiry: “How was your break?” Time and time again I am amazed by the enthusiasm of the response but also the genuine enquiry back: “And, how was your break, Mr. Seagram?” It should not surprise me anymore, but I still find it remarkable how comfortable and curious our students are with adults. Quite frankly, it is wonderful to converse with young adults who look one in the eye and grip a handshake firmly. This week my answer sings the praises of the Mexican people Belinda and I met over the break. Taking our first trip without children (or students) since our honeymoon, Belinda and I travelled to the Yucatan Peninsula and took in the sunshine and delights of Tulum, the Mayan Riviera, and the Caribbean. The local people may be diminutive but their hearts are hugely warm, their smiles even bigger and sunnier, and their sense of humour quick and generous. The temples and pyramids are astounding, as are the cultural and scientific elements of ancient Mayan society. Having the ability to make rubber thousands of years ago, they developed games which are similar to modern day basketball and field hockey. Being away from home always brings an appreciation for the joys of one’s own country. And so, despite returning to a snow storm (even the customs officers greeted us with laughter once we landed in Halifax!) we were glad to be back home on campus. However, a part of me wished that Canada had its own versions of traditional dancing, or songs that everyone knew and could belt out with pride, or that in Canada we were a little more comfortable greeting people with hugs. PS: Please spread the word that we are hosting an Open House on Friday, April 6th.